Call it the butterfly effect of healthcare. Like the theory that a single, slight, action can trigger a chain reaction, each visit to a healthcare provider, in person or through a telehealth portal, may nudge healthcare AV further along. With such a boom in healthcare AV, integrators need to make sure they provide top installations to help doctors diagnose patients properly. The healthcare AV market is nothing to sneeze at. According to a recent Mercom Capital Group report on funding and mergers and acquisitions activity, second quarter of 2015, venture capital funding, including private equity and corporate venture capital, in the health IT/digital health sector increased 53 percent QoQ (quarter on quarter), coming in at $1.2 billion in 138 deals compared to $784 million in 142 deals in Q1 2015, although it was down nearly 30 percent compared to the same quarter in 2014. Integrators must spend the time to discover the differences in how a healthcare organization deploys and uses these two classes of systems. 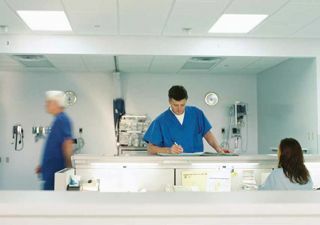 “Only then can an integrator deliver solutions that are flexible and scalable enough to address healthcare clients’ AV and public address needs as they evolve over time,” Kawasaki said. Rucker notes a recent Cedars Sinai Hospital project as an example of a large hybrid system installed to assist in the hospital’s annual surgical seminars. The installation required four operating studios located across multiple floors, a production control room, special conference rooms for consultations, and a large theater which hosts several hundred visiting physicians. Karen Mitchell is a freelance writer based in Boulder, CO.
AV technology as a game changer really hits home, quite literally, when it comes to healthcare. Owens cites the example of the Telstra Health recent launch of its MyCareManager portal, continuously connecting doctors and nurses with his or her patients. The portal is an all-in-one gateway that combines real time and historical data and remote monitoring with class-leading videoconferencing technology from Pexip that is focused on delivering the right data at the right time.